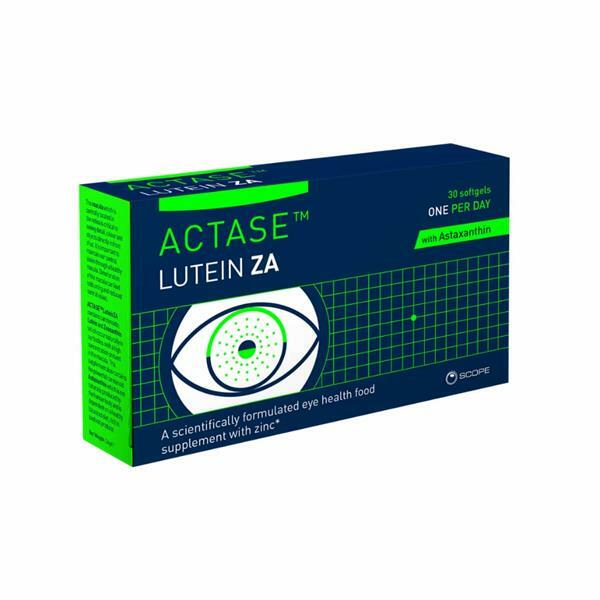 Actase Lutein ZA is a targeted eye supplement with Zinc to help maintain healthy vision. It also contains Vitamin C and E which helps protect the cells from oxidative stress, plus copper to help maintain healthy connective tissue. Actase ™ Lutein ZA contains carotenoids Lutein and Zeaxanthin, which are plant-based pigments found to concentrate naturally in the macula. Soya Bean Oil, Ascorbic Acid, Lutein - Rr - Zeaxanthin, Astaxanthin, D-a-tocopherol, Zinc Oxide, Emulsifier: Lecithin, Cupric Sulphate, Cholecalciferol, Capsule: Gelatin (Bovine). Adults take 1 softgel per day with meals. This product is not suitable for anyone under the age of 18 years.